I lied. I promised my next blog post would be about sub-space. Shoot me but this photo grabbed me deep down inside and I wanted to share it. This young man is the face of Hurricane Harvey for me. Who is he? 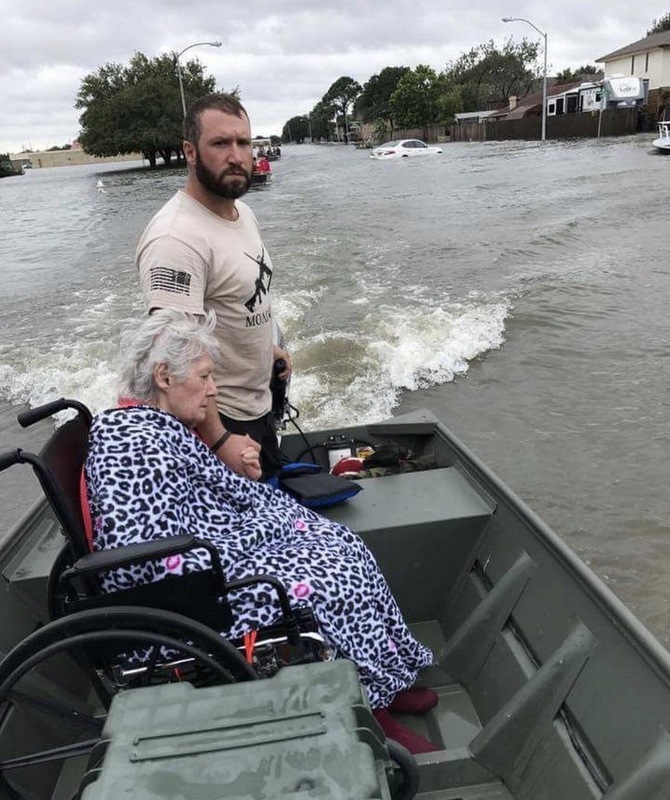 A military veteren and a volunteer from what we call The Cajun Navy (a group of citizen volunteers from Louisiana who answered their neighbors’ call for help). This man is you, this man is me. This man is the 2017 face of Masculinity in these times of beta, soy-ingesting, weak and demoralized male cuckolds. There is resolve in his tired face. There is a gentle tenderness in his hand. Honestly, if you are reading this blog and this photo doesn’t do anything to warm your soul, I feel regret who you have become. But there is still hope for you. There is no end point to all this other than a certain death one day. How you manage the ups and downs, how you wake up each day with the thought “Something wonderful is about to happen today”, how you work to see this magical world thru the eyes of a child or a little you know and love… this is the journey we are all on. I’m from Texas. I live and love in Texas. These last 10 days have been rough. Yet neighbor helping neighbor is who we are and what we do. Times like these will be viewed in retrospect as our Finest Hour. Be Strong, Men! And don’t lose the ability to connect. This man is the face of Masculinity for me. If you are struggling to find your inner manly strength and don’t know where to start, I say start with this guy. Be like this man. Fake it till you make it. It’ll happen. Find the opportunity to help someone around you, by being a solid leader, making good decisions and connecting with those around you who rely on your strength. This happens one man at a time. makes me Texsubmissive PROUD ! The happiest married women I know are married to masculine men. The happiest married men I know are leaders of their families.